Released in a 4-panel black-tray Digipak with a die-cut slot for the booklet; includes a 12-page booklet with lyrics. 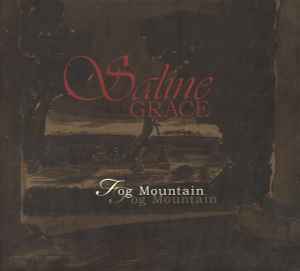 After a moment’s silence, Saline Grace are back with their latest album ‘Fog Mountain’ and an official video. During his parental leave, mastermind Ricardo Hoffmann made time for a short guest appearance, joining Hamburg-based band Dark Orange on their latest 2CD album ‘Horizont’. Along with Steven Burrows, a member of English cult band And Also The Trees, on bass, Ricardo Hoffmann contributed on additional guitars and piano. He furthermore created a remix for ‘Interpretations’, the second CD of the same release; other remixes were made by artists like Robin Guthrie of Cocteau Twins, members of And Also The Trees and many more. With ‘Fog Mountain’, however, Saline Grace continue on their very own paths, setting great store by the use of almost exclusively acoustic instruments that seem to hail from an antique musical instruments shop. The extraordinarily filigree guitar style with its wistful slide techniques, mandolin-like ornaments and fingerstyle parts is recognisably Ricardo Hoffmann’s, who knows to create pictorial synaesthesias, raising nightly panoramas from imaginatively enraptured roadmovies. Subtly woven into a dusty sound stage, mainly consisting of piano, organ, concertina, banjo, violin, accentuated drums, not uncommonly played with brushes, as well as Ines Hoffmann’s deeply resonating bass, the listener is inevitably getting entangled in a mystic and sinister atmosphere, drawing marvellously attention to singer, songwriter and multi-instrumentalist Ricardo Hoffmann’s emotional baritone. Among personal contents, his protagonists act full of symbolism in front of surreal, near-natural sceneries and reflect frequently anthropological backgrounds, dealing with mankind’s estrangement from nature and within their artificial environment, their culture, too. Their new album shows Saline Grace more powerful and on their highest level, performing with virtuosity, vigorous dynamics and withdrawn melancholy at the same time. Indeed, ‘Fog Mountain’ impresses with diversity of its arrangements, variety of vocals and its uniquely captured atmosphere, captivating the listener not only by catchy melodies, but also by Ricardo Hoffmann’s distinctive voice, who conveys deep melancholy coupled with hidden rage, solitude and, in very few instances, hope as well.